Homepage > Featured > We Liked What We Saw! 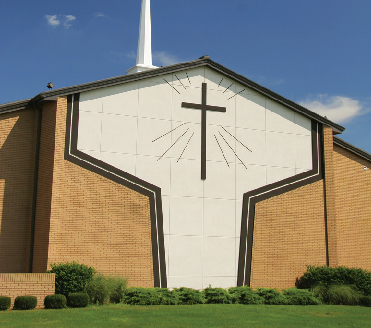 On September 1, 2009 I retired after 28 fulfilling years with Worthington (Ohio) Christian Church. We had given a one-year notice and the search committee was close to making a recommendation. Because I was the only preaching minister 80-90 percent of the people had ever known, Judy and I were convinced we needed to make ourselves scarce for at least a year as the church called and became comfortable with the leadership of a new preacher. But we intended to go to church. So we decided to go to churches—to move around the state, to visit different congregations, to listen in and celebrate Sunday worship with different segments of the family. In just over 12 months we visited 45 different congregations. Occasionally I was a guest preacher. Most often we were just worshippers and friends. Each week I made a few notes when we got home. I hope that what I have been believing and saying for quite a few years is an appropriate analogy—that the Sunday morning service with our churches is like the practice field where we get ready for the game, the huddle where we get ready to run a play against the other team. It’s not the game itself. It prepares us for the game, the conflict, the opportunity to win. It’s where we teach, inspire, encourage, build strength and endurance, and run plays. It’s where we prepare minds, hearts, and muscle—where we correct bad habits (ineffective, harmful things) and ingrain good ones (effective, helpful ones). Ephesians 6:10-12 could be our text. We need to put on the armor of God. Our struggle is against the spiritual forces of evil. The church, Sunday morning and otherwise, must help us “stand firm against the schemes of the devil.” It must help us help others stand firm—and recruit defectors from the opposing team! As we traveled around I expected that our Sunday morning visits would find the church doing that—sending us away (us, being lots of us) with hope, help, and valuable things to think about. Nearly always the preaching was worthy in its preparation, biblical faithfulness, effective style, and spirit. There were a few instances of “not yet really ready” and a very few instances of an unworthy flaw. Kudos to the preachers! I was thrilled. The music was “all over the map.” Normally it seemed to fit the congregation and community. A few times it seemed to ignore the congregation. Almost always the musical quality was good. Candidly it probably missed the “Why are we here?” test more often than the preaching did. Most congregations showed a comfortable friendliness (seldom pushy, seldom inwardly focused) and most displayed a real and worthy effort at fellowship. That was good. The quality and quantity of participation on the part of other people up front (in addition to preacher and worship leader) offered the greatest variety in ability, effectiveness, and sense of timing—from “very good,” to “just right,” to “nice try” with a few that were not the best judgment. The majority presented Communion time with appropriate dignity and reverence. A few missed the opportunity because of placement in the service and hurry—but not many. The invitation time needed more work in most cases. In some instances there was no invitation. The gathered church must be the church. It is the body of Christ and it must act like it. When it is together it is to address those who are present, not those we wish were present. Still it says what it says and does what it does not only to benefit those present, but to equip them to serve, love, and beckon those who are not present—the lost, the injured, the hurting, the dispirited, and the careless. It speaks to those who are present. It speaks for those who are not present. It speaks from the one who is ever-present. That’s what we were looking for. What did we find? • A meaningful baptism, with brief personal testim-ony, early in the service. • Announcements on the screen, with an out-of-sight voice, using no wasted words. • A well-planned missionary interview. • A great month-long theme, carried through the whole service each week, with visuals up front, and the minister, worship leader, and elders all speaking to the theme. • A new song sung first by the worship leader, who then used his hands to help us with the tune when we joined in (words on the screen, of course). • A particularly well-woven, mid-range con-temporary song service leading into “How Wonderful” and a prayer guiding us to Commun-ion, with simple instructions on the screen for our participation. • A well timed period of silence and Scripture read together, from the screen (most of us have done that). • A sermon series reinforced by large special drawings up front and visuals on the screen. • A prepared, personal, and brief prayer time conducted with evident care. • A multiple-service church where the minister had to speak in the same hour in two places. All of the contemporary services were built the same way—a bit of singing, then the sermon, then comfortable worship, Communion, and a mission moment after. In the traditional service those elements were first, and the musicians and worship leader were prepared for a comfortable “stretch” if necessary. Some elements of worship in the churches we visited left us thinking, I am encouraged. I’m glad we were there. It’s been a great start to the week. • Those who led the service were well prepared to do what they did. • I got the theme, the morning’s point. • The people up front were prompters, not attention getters. • The people related to one another in positive ways. • The facilities were clean, neat, and orderly. It showed they care. • The focus was on God and on Christ—not on me and my problems. • It was clear that attention and energy were being expended to continue positive momentum. • The congregational singing was great! • The instruments helped us sing. They prompted us and built a foundation for us. They didn’t eliminate us. • The Communion meditation was clear, appropriate, personal, timely, and not lengthy. • The screen operator was right on time with the words. • Positive, warm people were at the welcome centers and in the parking lot. • The preacher, who used a manuscript, wrote the way he talks— with innocent, engaging humor. Some encounters left us thinking, If we were looking for a church home, we probably wouldn’t come back here. • Sunday morning seemed to be a time for some folks to practice. • The leaders up front set a very low bar in the way they chose to dress. • A worship leader expected the congregation to sing, but the people didn’t have a clue—and we were standing. Another worship leader with a stained glass voice talked a good deal too much. Another who seemed doctrinally challenged had too much responsibility in his hands. • One service included a painful electric guitar. Another time a dancer with a guitar played secular music. • Elders were stationed around the preacher like secret service agents around the president. • A young man wearing ragged blue jeans gave a lengthy, rambling, whispered, and unprepared mission presentation. • In one strong church we endured wearying repetition in the song service. • In one service we found new wine in old wine skins—contemporary music and a piano player not equipped to handle it. Write a song this week, practice it with the band, put the words on the screen, have us stand, and expect us to worship. • Consistency in quality and in spirit with some little surprises—a freshness. • Purpose (what we are about). • Understanding and responsiveness (who is here, and who is around us). Most of the time we are back home on Sunday now. The new preacher is a good friend who welcomes us in worship. I have put away my score pad. So if we show up at your place on Sunday, we are just there to fellowship, to be fed, to say “We’re with you,” and to celebrate, not evaluate. Ask your minister questions about things in the sermon that got you thinking. Greet people you don’t know. Bonus points if you can remember their names the next week. Be prepared and engage in discussions in Sunday school and Bible study. Volunteer. Does something need done that you’re good at or could learn to do? Sign up. • Thank the woman who works full-time all week, then spends her Sunday mornings with the twos and threes. • Thank the person who makes sure the right slide is on the screen all through the service. • Thank the man whose thoughtful Communion prayer brought you to a more worshipful frame of mind. • Thank the suffering saints who stayed up all night with the teens. • Thank the person who shows up early to make coffee for the congregation. • Thank the teen who is using her skills from the school band to add to the worship time. local church Marshall Hayden We Liked What We Saw! Previous StoryWhat’s not to like?